Posted March 11th, 2019 by roadhouseHG & filed under News. Spanky’s Roadhouse has long had a “college bar” reputation because of its close proximity to the University of Denver. That reputation may hold true on weekdays and packed Friday nights, but brunch attracts a more diverse crowd. From a build-your-own drink bar to inventive dishes and classic favorites, Spanky’s can entertain all comers. Spanky’s isn’t content with pouring you the same old orange-juice mimosas; instead, you have a choice of five juices — orange, cranberry, grapefruit, pineapple or mango, plus a rotating weekly special — all for only $11 bottomless. Last week’s special was fruit punch, but general manager Katie Kingston says she plans on changing the flavor every week to keep patrons on their toes. Just step up to the mimosa bar and mix and match; servers come around with pitchers of sparkling wine to top you off. To continue the fruity theme, I started brunch with peaches and cream French toast. These slabs are built with thick-cut Texas toast, so the interior stays moist while the coating is just a little crunchy. They were covered in sweet mascarpone cream and diced peaches; the portion is generous and hearty enough to soak up multiple rounds of mimosas. The dish also comes with a choice of three syrups: maple, blueberry and strawberry. Posted March 8th, 2019 by roadhouseHG & filed under News. Spanky’s most recent inclusion in The Denver Business Journal’s article titled, Full Plate: This Week’s Denver Area Restaurant News. Spanky’s Roadhouse, a longtime University of Denver dive bar, has revamped its look and its menu, offering up “sleek and contemporary finishes” and more health-minded food options — but keeping a variety of bust-your-gut burgers available to signify it hasn’t forgotten its roots. Posted October 18th, 2018 by roadhouseHG & filed under News. A native of Des Moines, Iowa, James Doxon found his calling to cuisine while a design student at Iowa State University. He enrolled in the well-established Iowa Culinary Institute in Ankeny and embraced his new career with passion. Upon graduation, he worked in various bistro-style farm to table restaurants in Des Moines and Ames. One year later, he secured a position as Sous Chef at Kahill’s Steak, Fish, and Chophouse in South Sioux City, Nebraska overlooking the majestic Missouri River. In 2012, at the age of 24, Chef James was titled Executive Sous Chef/ Executive Banquet Chef and quickly became an indispensable asset to the restaurant, bringing his exquisite palate and creativity to everything he touched. Before leaving Nebraska with his wife to discover new possibilities in Colorado, he was privileged to be nominated for a James Beard Award. While in Denver, Colorado, he found his home with Roadhouse Hospitality Group and in March 2014, he was named an Executive Chef, a role in which he continues to delight guests with his refined, contemporary cuisine. While growing as a Chef, James traveled around Europe learning flavors and techniques from various chefs and their cultures. On any given day Chef James can be found creating dishes influenced by his humble beginnings in the Midwest. He believes the most flavorful cuisine is made simply with the best, highest quality products and he considers it part of his job to inspire and educate guests about the bounty that surrounds us. 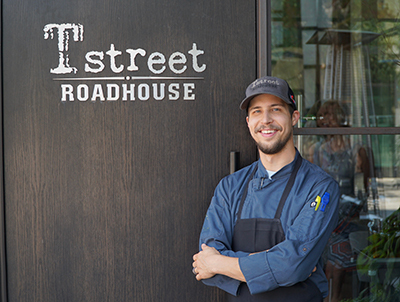 Click here to learn more about Tstreet Roadhouse! Posted January 11th, 2018 by roadhouseHG & filed under News. Local bars competing for “Denver’s Best Martini,” including: Cater Rendezvous, Jax FishHouse & Oyster Bar, Punch Bowl Social, Stoney’s Bar & Grill, T-Street Roadhouse, Thirsty Lion Gastropub & Grill, Tupelo Honey and Whiskey Biscuit! Silent Auction including a Southwest Airlines voucher, fitness memberships, restaurant gift cards and other luxury items. Over 500 guests along with celebrity guest judges. New for 2018: Presentation at 8 pm. Try an exclusive martini, meet BHGH alumni and win door prizes! Dance the night away with The Tent Show Kings, and enjoy food provided by Roadhouse Hospitality Group. Posted February 9th, 2017 by roadhouseHG & filed under News. DO Chef Panel: Who Do You Love to Cook For? The month of love is upon us. With Valentine’s Day fast approaching, we turned to our chefs and asked them the simple question, “Who do you love to cook for?” Let the brownie points commence! Posted January 12th, 2017 by roadhouseHG & filed under News. Posted December 2nd, 2016 by roadhouseHG & filed under News. Posted November 30th, 2016 by roadhouseHG & filed under News. Posted September 22nd, 2016 by roadhouseHG & filed under News. The Boulder Depot is nothing new. In fact, the building dates back to 1890 when it functioned as a train station at 14th and Canyon. But by the mid-1950s, train transportation had taken a back seat to the illustrious automobile, rendering this particular depot increasingly less useful. By 1973, the building was slated for demolition. That’s when one of Boulder’s founding families, the Jaycees, came to the rescue; by orchestrating community fundraising, they were able to purchase the building and move it to the PowWow Rodeo Grounds east of downtown. For decades, it functioned as an event space and concession stand, until the Roadhouse Hospitality Group proprietors, John and Dan Shipp, purchased it, moved it to its current digs at Pearl and 30th, and lovingly renovated the space to reflect both the depot’s history and its new life as a forward-thinking, Boulder-centric eatery. While relatively small, The Boulder Depot space is impressively dynamic. The main level features nooks and crannies, dotted with local artists’ craftwork—like the iconic caged lights dangling above—and restored elements from the original depot, including sprawling walls of stone and, in a cheeky nod to the past, railroad tie tops on the bar’s beer taps. The small but mighty kitchen, meanwhile, tucks into the far corner, churning out thin-crust flatbreads, salads, apps, and burgers galore. Downstairs, The Depot offers a bit of a surprise—a private dining space for 60 or so. With its own bar and an alcove for game-watching, its the perfect spot for a range of occasions. They’ve even been known to host anniversary parties for weddings that took place at The Depot in the “PowWow Era.” All along the walls on both levels, guests will see remembrances of the days of yore; from newspaper clippings of the Jaycees renovation in the ’70s to the more recent remodel, these moments in time anchor the history of The Depot that has never been—and never will be—forgotten. Posted March 4th, 2016 by roadhouseHG & filed under News. Thank you to Vail Daily and Summit Daily News for featuring Roadhouse Hospitality Group recently.